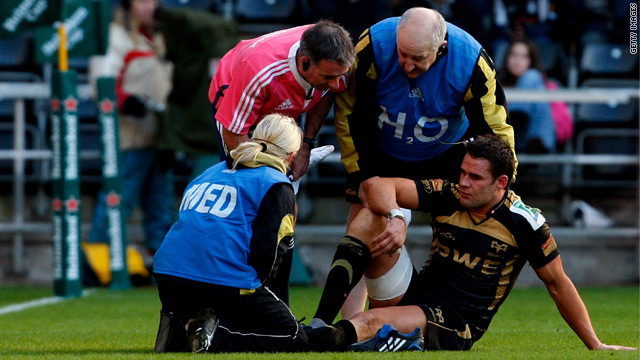 Lee Byrne receives treatment on the field during the Osprey's European Cup win against the Leicester Tigers. (CNN) -- Wales can call on fullback Lee Byrne for Saturday's opening Six Nations rugby clash with England after the British and Irish Lions star won his appeal against a suspension. The 29-year-old was handed a two-week ban after coming back onto the pitch illegally as a 16th player for his Welsh club the Ospreys in a European Cup match against English side Leicester Tigers last month. He was found guilty of a misconduct complaint at a hearing on January 29, having re-entered the pitch without the referee's permission. However, Byrne is now free to line up for coach Warren Gatland's team after an independent appeal committee who convened in Scotland on Tuesday night ruled that the original decision had been in error. The European Rugby Cup official Web site reported that the sanction had been altered to a fine of €5,000 ($7,000). Byrne, who was one of Wales' key players when the British principality won the 2008 Six Nations title, is now eligible to line up at England's Twickenham headquarters. Leicester, who lost the match and were eliminated from the tournament, had complained after he came back on after being treated for a toe injury, with his replacement Sonny Parker still on the field. The Ospreys were also fined $35,000 for the club's part in the incident. Byrne missed Wales' November international schedule due to injury, but is now expected to be named in Gatland's squad on Wednesday. Wales finished fourth in the tournament last year, winning three of five games as did second-placed England. Champions Ireland start their 2010 campaign at home to Italy on Saturday, while Scotland host France on Sunday. The tournament is played every year by the leading northern hemisphere rugby nations.